More and more couples are utilizing Prenuptial Agreements, also called Prenups or Premarital Agreements, to protect their assets and remove control of the division of assets from the Court’s discretion in the event of a divorce. However, mistakes in drafting or execution of the Agreement creates a risk that the agreement will be declared unenforceable. If that occurs, the couple is essentially back to square one. There is less chance of that occurring, however, if you are well versed in the law surrounding Prenuptial Agreements, and know the rules necessary to ensure a valid Agreement. One very common reason that a Prenup might be declared unenforceable is that the time given to one spouse to review the provisions of the agreement was insufficient. Nevada has adopted the Uniform Premarital Agreement Act (UPAA) which requires that both spouses execute the agreement voluntarily in order for it to be enforceable. Additionally, there have been cases which have argued that consent is not truly voluntary when relevant information is not provided. Whichever legal reasoning may fit your case best, it is possible to argue that a lack of sufficient time to review the agreement is unjust or unconscionable. Nevada law does not prescribe a specific amount of time that must be given in order for the agreement to pass muster, but experts tend to agree that at least one month or more is reasonable, depending on the complexity of the assets involved. Without that time to review the agreement, the future bride or groom might be deprived of their right in equity to ask for changes or modifications. As one might imagine, the most common method of rendering a Prenuptial Agreement unenforceable is for one spouse to be coerced into signing, or for one spouse to sign the agreement under false pretenses. It is not uncommon for spouses to either 1) make mistakes in asset disclosure, or 2) consciously hide assets, and either action can render the entire Prenuptial Agreement unenforceable because concealment of such information is against public policy and state law. It is also worth noting that a Prenup may be ruled unconscionable where it is so heavily weighted toward one spouse, to the detriment of the other, that the contract itself is inherently unfair or unjust. Nevada law does not specifically define what is ‘unconscionable,’ but if you are able to show that the Prenuptial Agreement would place you in a subservient or otherwise vulnerable position, it is plausible that such an agreement could be declared void, especially since Prenuptial Agreements do not often contain severability clauses. Prenuptial agreements can make a big difference in your peace of mind, but they can also cause problems if not drafted properly. 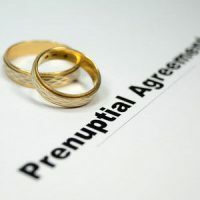 The experienced Las Vegas Prenuptial Agreement attorneys at the Kainen Law Group can help answer your questions and guide you through the process of drafting a prenup that will stand up in court. Contact us today to set up an initial consultation.